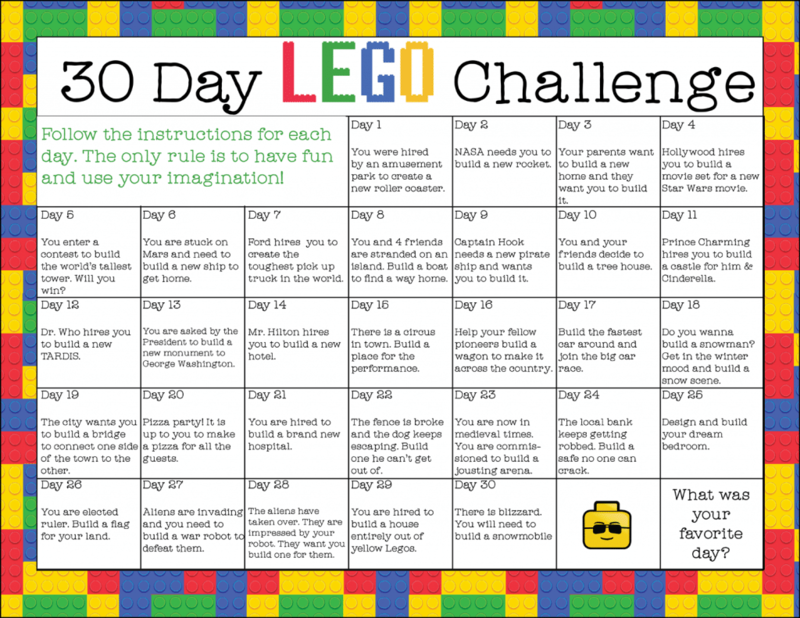 ** Make sure you also download the 31-Day LEGO Challenge Printable Calendar with all new prompts! Sometimes, it only take a little bit of a prompt to get the creative juices flowing. 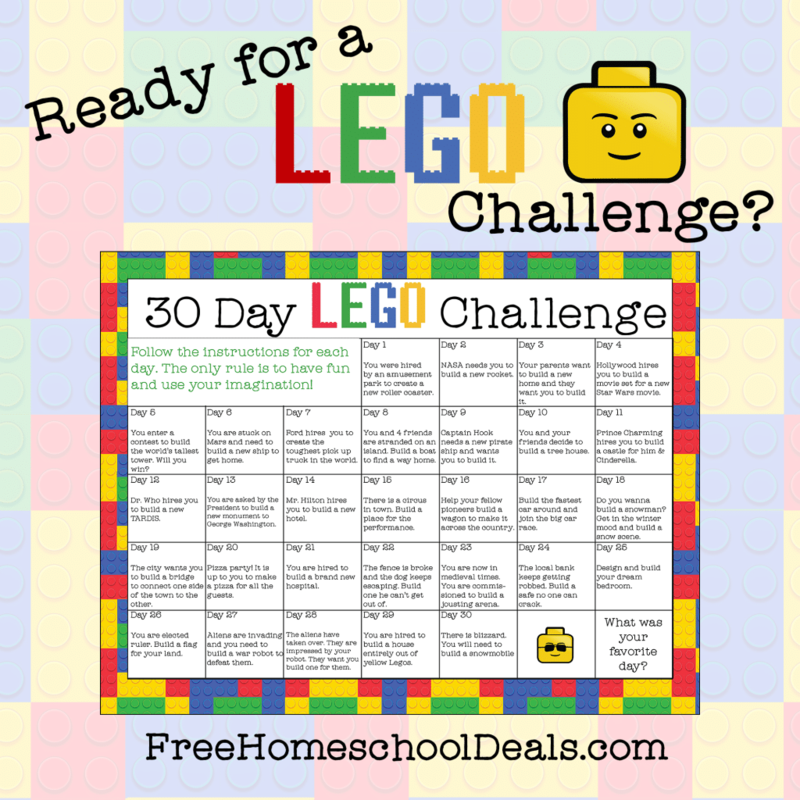 The prompts included in this printable LEGO calendar do just that! For each day, a specific LEGO building idea is presented. Day 2: NASA needs you to build a new rocket. Day 24: The local bank keeps getting robbed. Build a safe no one can crack! Each day is assigned a task, and it’s up to your creative kiddo to complete it! → Choose a specific time of day to complete the LEGO challenge – each morning after breakfast, during your morning Family Time (Circle Time, etc), or maybe even as an after dinner activity with Dad! 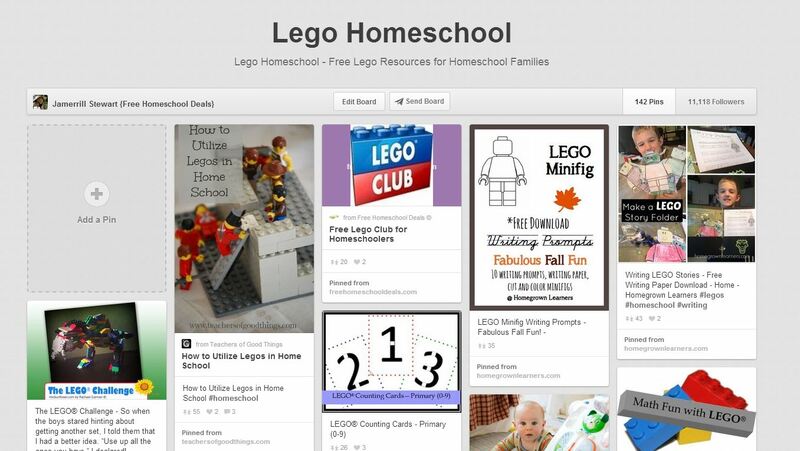 → Have a LEGO Challenge race: Who can complete their challenge the quickest? Using the most LEGO? Using the least? Using only one color? The possibilities are endless! → Help your child take a picture of each day’s creation. Then create a collage at the end of the challenge. → After the challenge each day, encourage your child to write a few sentences (or paragraphs, depending on ability) about their creation. What other ideas can you think of to use this 30-Day LEGO Challenge? This is awesome! What a great activity! I’m going to share with all my friends with kids. Thank you so much for sharing.